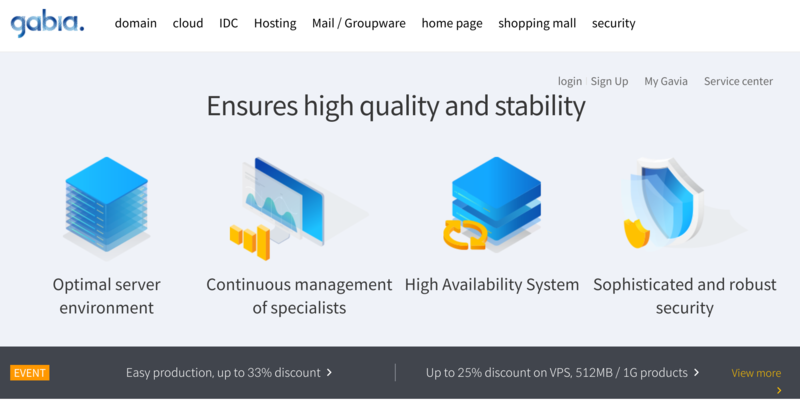 Gabia Review 2019: Is Gabia a Good Hosting? Based in South Korea, Gabia provides web hosting, cloud service, security management, and domain registration services. They offer everything from cheap web hosting plans to impressive support for bigger businesses, plus web development and branding services for start-ups. Gabia provides IT infrastructure and hosting solutions to businesses in Korea. Although they began as a domain and web host provider in 1999, they now also offer single and groupware cloud services plus security management. With more than 53,000 hosted partners, their commitment to customers continues. Gabia differentiates itself from other Korean hosting providers by allowing customers to control and customize the infrastructure to meet their specific needs. They provide a variety of solutions including domain registration, web hosting, cloud solutions, electronic payment, and mail hosting. They pay particular attention to start-ups via their starter packages for website development and branding. You can choose between Linux and Windows hosting plans. Linux servers support Java language development, and Windows servers support development using the .NET languages. They do not offer free domain names on their hosting plans, but you do get a discount when purchasing a hosting plan and domain name at the same time. I particularly like their support for Microsoft Azure and Amazon Web Services (AWS) cloud infrastructure, which allows you to have your files hosted on the cloud and managed by Microsoft or Amazon. This provides a degree of peace-of-mind, and the same thing applies to the RAID infrastructure. Due to limited storage, Gabia’s plans are only suitable for the basic and mid-range websites. The enterprise standard plan comes with only 5 GB disk space, while the enterprise premium ‘unlimited’ plan comes with only 20 GB disk space. You get just 1 GB with a personal plan. These relatively meager allowances might be enough if you’re just starting out with your website, but big e-commerce businesses would likely look elsewhere. Beginners should have few issues with this web host. While there is no mention of one-click installers, there is a WordPress hosting plan with real-time backup and weekly reports. You’ll also find relevant articles about web hosting and related terminologies in their resource center. Gabia’s pricing is quite competitive considering the top-notch service they offer their customers. The only downside is that whereas most web hosting companies set up your server at no additional cost, Gabia levies a one-time extra installation fee. But not too high, you’ll be pleased to hear. Monthly payments are available, so you can try their services and support using this option before you buy an annual plan. In terms of support, you can call them or send an email, but don’t expect a rapid response. Alternatively, you can sign up to access the member service area where you should receive a quicker reply. Gabia offers a unique package for businesses looking to build their online space. They provide cheap hosting plans and support for external cloud servers. While their packages are particularly suited to small and medium-sized companies, they may not cater to the needs of big business. Wondering how Gabia stacks up against other Web Hosting companies? Enter any other Web Hosting company and we will give you a side-by-side comparison.